FEMTO-ST is a laboratory associated with the LNE (National Laboratory of Metrology and Testing) under the Technical Unit 2-13 of the LTFB (Time Frequency Laboratory of Besançon). The goal is to carry out calibrations (connection to a primary reference) under accreditation COFRAC (French Accreditation Committee). UT 2-06: This activity focuses on the characterization of frequency sources by the measurement of frequency drift, the measurement of time intervals, the measurement of frequency instability as a function of the measurement time (tau): Long-term (tau ≥ 10 days). - or in the SPECTRAL DOMAIN (Frequency 5MHz up to 26GHz) by measuring the spectral density of the phase or frequency fluctuations for Fourier frequencies ranging from 1Hz to 100MHz. 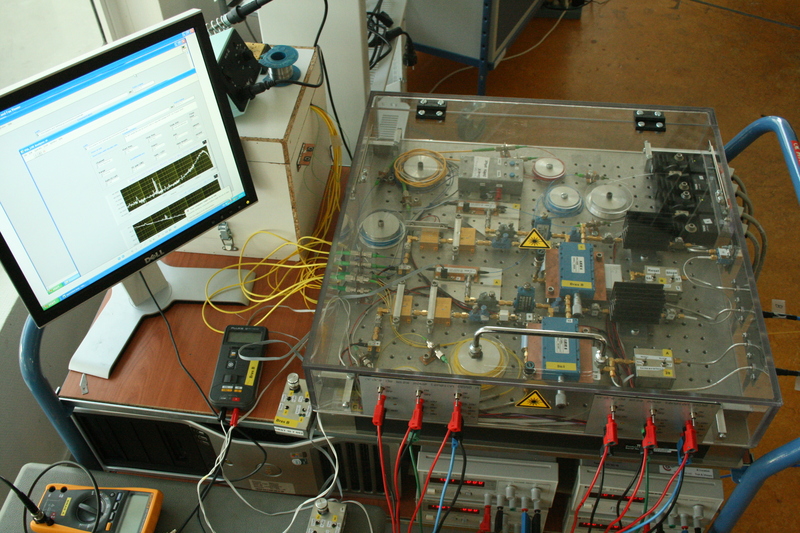 A project contract "LNE / DRST 10 7 002", started in 2011, enabled LTFB-UT 2-13 to develop a new state-of-the-art phase noise measurement bench whose objective of this project Was to produce an optoelectronic bench of phase noise measurements with optical delay lines by decreasing the noise floors by intercorrelation up to -170 dB.rad² / Hz at 1kHz of the carrier, chosen initially around Of 10 GHz. This is a new measurement technique that combines the advantages of microwaves with those of optics. The interest is to be able to calibrate frequency sources without referring to a standard. The measurement is done directly and does not require comparison. This bench was accredited by COFRAC in July 2013 at 10GHz and the request for extension on the 8-12GHz range is currently being studied at COFRAC. Maintaining measurement capabilities with, for example, the development and development of a new frequency accuracy measuring bench for frequency sources of 5MHz or 10MHz to alleviate the aging of the devices. This new bench is operational and it is planned to bring it into our accreditation soon. In 1973: Birth of the calibration activities within the LPMO (Laboratory of Physics and Metrology of Oscillators). The calibration center was successively BNM (National Bureau of Metrology), FRETAC, then COFRAC in 1995. In May 2001: Signature of an association contract between the BNM and the CNRS. In March 2002: Validation by the COFRAC of the technical file of the laboratory containing the precise description of the methods of calibrations used as well as all the uncertainties associated with the results of calibrations. In July 2002: Transition to the new ISO 17025 standard. January 1, 2004: FEMTO-ST replaces the LPMO. January 1st, 2005: BNM activities transferred to the LNE (National Laboratory of Essays) March 1st, 2008: Merger of the accredited laboratories of the Observatory of Besançon (N ° 2-06) and of FEMTO-ST (N ° 2-13) within a new structure: LTFB, which currently has a dozen permanent staff.